Want to get to your island resort in your own time, no panic about catching the early ferry or long hours sitting on a boat. Taking a seaplane or heli is the ultimate way to go. Not only can you leave when you want, but you'll get a fantastic scenic tour along the way. You'll get to see stunning coral reefs, beautiful blue waters and tropical islands by the bucket load as you fly over them! 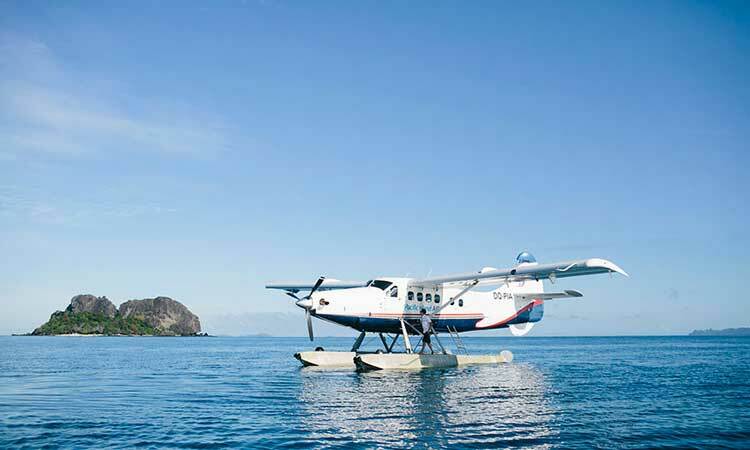 As a rough guide it's about a 30min flight to Blue Lagoon on the seaplane and 5 hours by ferry on the Yasawa Flyer. Ok so it's going to cost you more, but hey it's well worth it. There are 4 companies that fly out to the islands: Pacific Island Air, Island Hoppers, Turtle Airways & Heli Tours. These companies service the Mamanuca & Yasawa Islands and some of the mainland by fixed wing plane. The only down side is the amount of luggage you can take, there are strict limits and usually less then your big airline. You'll find all the air transfer companies available to book through the form below. Start by choosing Nadi Airport then your resort, you should see another "Product" box appear. This will show all the different options and who fly's there. Click on each one to see the prices. You can also book your return flight as well if needed. For next day bookings please get them in before 12pm the previous day. Cancellations made more than 72 hours before travel will attract a 20% cancellation fee. Cancellations made within 72 hours of travel will result in a 100% cancellation fee. Cancellation fees apply from within seven days of travel.